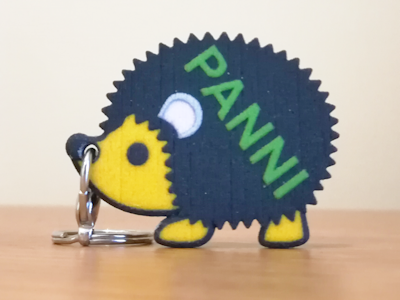 Would you like a 3D printed animal keychain with a custom label on it? You are at the right place. With an unique 3D printed gift you can create imaginative and creative surprises for girls amd boys. Don’t forget the text on the keyring can be anything it only depends on your imagination what we will 3D print out. Eg. name, nickname, etc. What kind of animal keychain do you want? Give an animal keychain as a gift - who would not have a personal favourite animal? Write a message, a pointer: salvationist on the caterpillar, unforgettable on the elephant, cautious on the cougar or just a name and for anyone you can give a unique personal gift! And if you're looking for a pink panther or a lazy sloth, maybe an owl key ring, write to us and we'll plan it for you too. But we will not be afraid of making an Ursus melanoleuca (black and white bear, or panda) neither. We have implemented many creative requests with 3D printing. We have already made Honda Civic Shaped Keychain, Fitness Step Pad Keychain, Saxophone Bookend or HIP-HOP Penholder as well. You can order us from 1 piece (no minimum order quantity of hundreds of pieces ) but we also make souvenirs for friends, school classes and smaller companies according to individual needs. Would you like an animal keychain, because you have one too (panther, sloth, owl, bunny, elephant, etc)? Nowdays a modern keychain is not only a practical way to keep keys together but a trendy and fashion accessory. These style of key rings can show your love to nature and your favorite animal. It doesn't matter that small or big, quiet or fearless they are always your amazing friend and these fun and useful key rings always will remind them. This could be a special, creative gift for kids or the nature lovers.